First, let’s tackle the nickname controversy. I recently took part in a Twitter debate about the proper nickname for the six-way intersection of Damen, North, and Milwaukee. 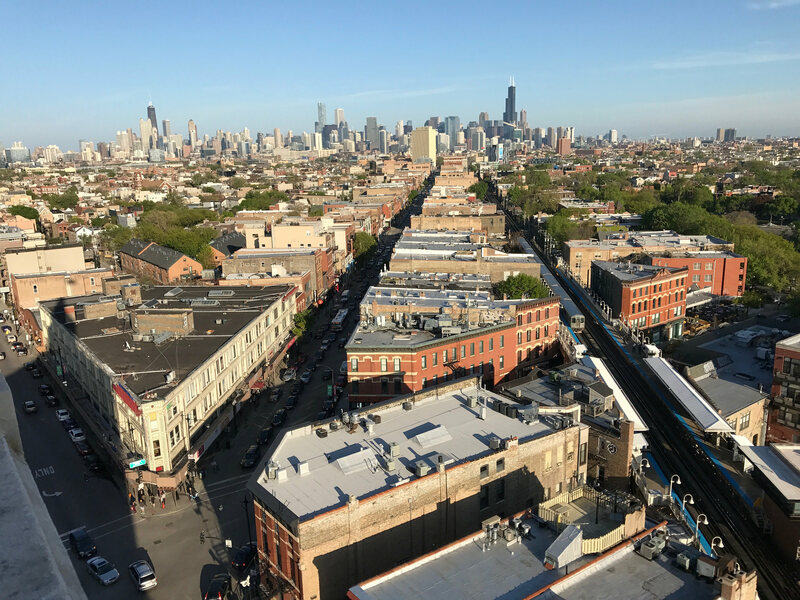 “Stop calling it Six Corners,” exhorted Robert Loerzel (winner of the Reader‘s 2016 reader poll for Best Chicagoan to Follow on Twitter), arguing that the real Six Corners is in Portage Park. Now that that’s out of the way, let’s look at the city’s proposal to improve safety at this crossroads, which features a hectic confluence of pedestrians, skateboarders, cyclists, cars, trucks, buses, and, occasionally, a bearded dude on a bike with a roll bar who does somersaults for tips. 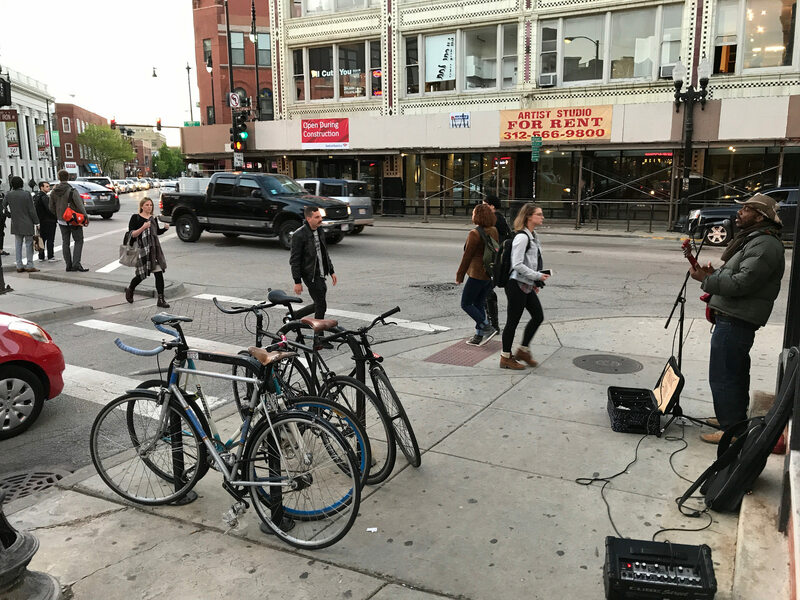 Last week, during a community meeting at Pritzker elementary, Chicago Department of Transportation reps outlined some “low-cost, quick-hit” upgrades to the intersection that they hope to make by the end of the year. The bad news is that Milwaukee is also a high-crash corridor, with 1,097 collisions in the area between 2010 and 2014, according to the city. While only 20 percent of the crashes involved pedestrians and bicyclists, these vulnerable road users were involved in 66 percent of crashes that resulted in injuries. Amsden outlined several ideas for improving the area’s safety. To create more standing room and shorten crossing distances, flexible plastic posts and street paint could be used to create temporary curb bump-outs, which could eventually be made permanent with concrete. Banning some left turns could also free up space for wider sidewalks by eliminating turn lanes, which could also reduce collisions and congestion. Amsden said that this approach would need to be done cautiously so as not to divert high numbers of cars to side streets. Another proposed idea is to close the “slip lane” at the south side of the Crotch, a channel between a pedestrian island and the sidewalk that allows drivers to make fast right turns but also endangers and inconveniences pedestrians. While CDOT counted more than 1,000 people walking across the slip lane during rush hours, a measly 32 motorists used it during the same period of time. 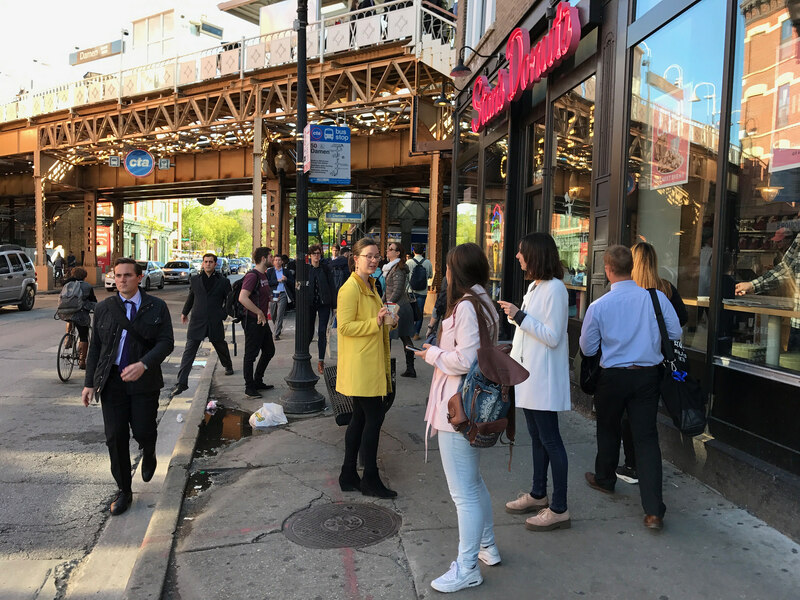 The department also found that about 400 pedestrians, largely Blue Line commuters heading to Bucktown, made an illegal crossing between the Starbucks at the southwest corner of the intersection and the Walgreens at the northern corner. They may sanction this move by painting a new crosswalk. Similarly, CDOT may legalize a harmless bike maneuver I call the Six Corners Shuffle. (Sorry, Portage Parkers.) When Milwaukee has a red, southeast-bound cyclists cross North Avenue with the walk signal, then wait for a green in front of the Starbucks to get a head start on car traffic. 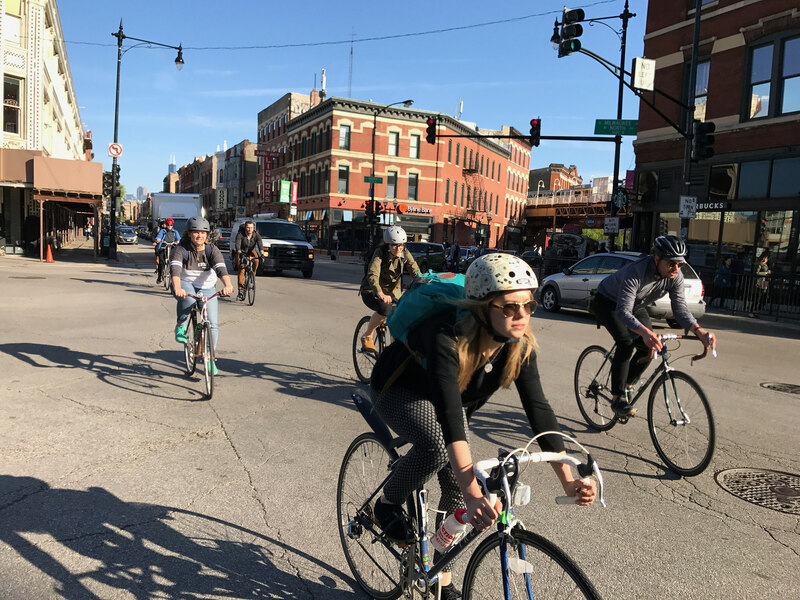 While police wrote lots of tickets for this move during a January sting, recent counts revealed that a whopping 65 percent of southeast-bound riders still do it, so CDOT may install a dedicated green light for bikes to legitimize the practice. 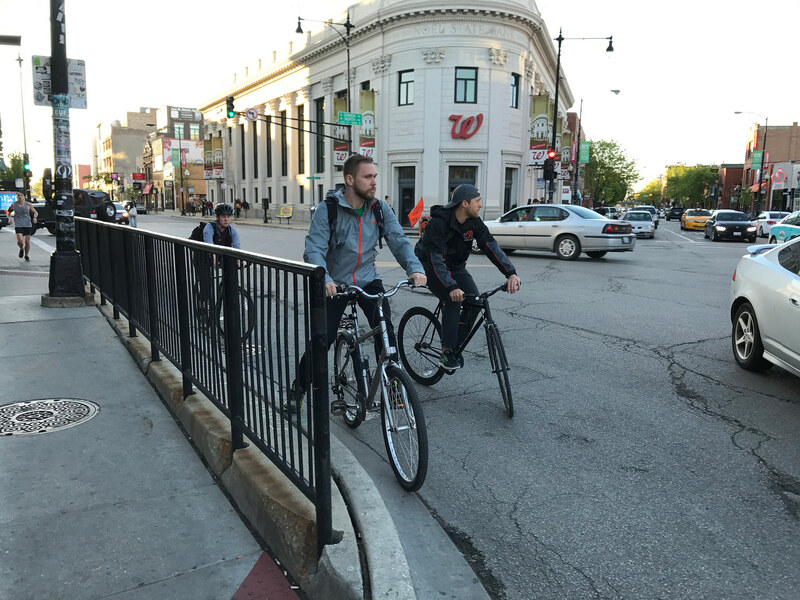 And because 28 percent of vehicles on Milwaukee in Wicker Park-Bucktown are bicycles, according to CDOT, but the road is currently too narrow for bike lanes, the department has floated the idea of stripping parking from one side to make room for the lanes. Since residents and business owners tend to freak out about parking removals, that would be a heavy lift politically, and the city would also have to compensate the parking meter concessionaire for any loss of revenue, so that seems unlikely to happen anytime soon. The feedback at last week’s meeting was generally positive, and local aldermen Proco Joe Moreno, Brian Hopkins, and Scott Waguespack all said they plan to chip in ward funds for the project, which is currently budgeted at $150,000. To further check the community’s pulse on these proposed changes, I dropped by the crossroads to buttonhole people during last Thursday’s evening rush. Priya Matthew, a tech worker coming home from O’Hare via the Blue Line, said she rarely drives, so didn’t have an opinion about limiting car movements. But she supported adding the crosswalk and widening the corners for pedestrians with paint and posts. “It’s really hard to move around this intersection,” she said. I also spoke with Jake, a driver who declined to give his last name, while he was stopped at a red, waiting to make a left turn from northbound Damen. Interestingly, he said he supports banning all lefts for motorists as a strategy to unclog the junction. “This whole intersection should just be straight-ahead for drivers,” he said. On the other hand, Erik Bowman, an assistant manager at a nearby sports bar, was opposed to any restrictions on drivers, even though he generally takes the Milwaukee bus to work. Indeed, as the traffic counts and crash numbers indicate, the status quo isn’t working. It’s high time for CDOT to correct the Crotch. Parking is already at a premium in the neighborhood, and with the amount of bad driving that goes through the hexa-f-, the goal is to eliminate the bottlenecks and establish the flow of traffic. If you see the amount of drivers who take side streets just to eliminate the intersection (because who wants to sit through 3 cycles on Damen), it means that the area is just crap. To assume the intersection doesn’t need to be fixed is also bad policy and NIMBYism at its finest. 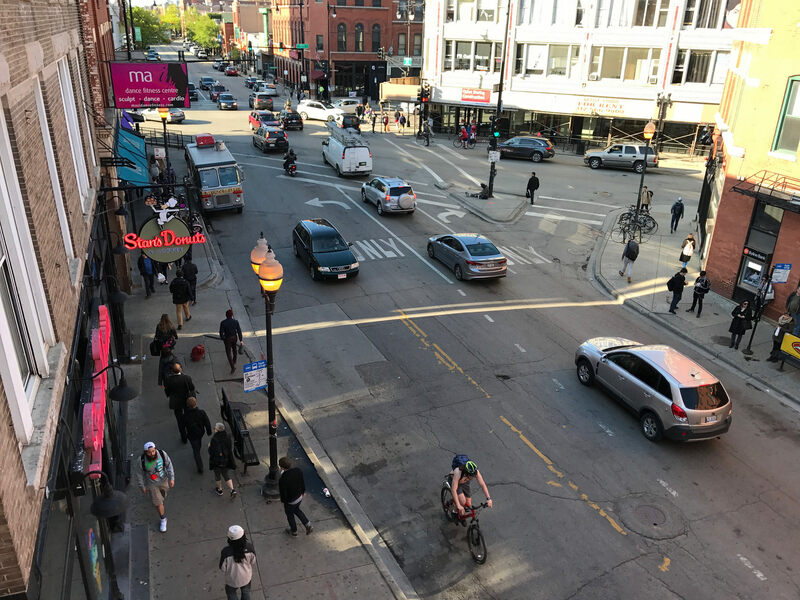 Transit signal priority, along with eliminating the slip lane (turn that and SB Damen to a parklet) and get rid of the Damen and North left turn lanes is a start. Also: Make the intersection to a free-for-all for pedestrians only (60 seconds?) so that the intersection can be walked through without a warzone feel to it. Ped scramble can’t be done as ADA requirements would make the scramble 1:30 long, which is damn long, cars would back up, and if you’re a pedestrian and you miss the scramble, now you have to wait too. It’s not workable. “Car traffic is what we bank on—hopefully people driving by see the bar,” he said. 1. It probably doesn’t. Almost all business owners overestimate the people driving to their store in the city. 2. You sell alcohol you buttmunch. You shouldn’t *want* your patrons to drive. I wish you’d tell me what sports bar he runs so I can never give that idiot any money. Christ on a bike. Strip all the parking from Milwaukee. If bikes are 40% of the traffic, they deserve 40% of the road. Pay for the meter removal by increasing the fees on surrounding streets to increase turnover (which actually IS good for local business!). This southpaw would like to see far more attention paid to the need and placement of left turn lanes. They cause a disproportionate amount of headaches at many intersections, but especially six cornered ones. Good points, but let’s keep the language reasonably respectful. Thanks. The area in red needs to be closed to cars, because it actually worsens the problem. The orange shows a weakened version. The area in the green line should be used by cars. Why is the Starbucks to Walgreens crossing illegal? Are there signs prohibiting it? I don’t recall any, but I’m not there all that often. If there aren’t signs prohibiting that crossing, then it’s just jaywalking which isn’t illegal in Chicago. Peds in such a case must yield the right of way, but it’s not illegal. I believe that at an intersection with walk signals, you can only make signalized crossings, which are generally marked with crosswalks. “Hopefully” doesn’t seem like good business plan to begin with. I love out of the box ideas and this is one. So if I get your intent you are suggesting chicaning Damen around the red area! Then you are pulling the NW bound Milwaukee traffic farther back from the intersection during their red light and lightly chacaning it as well. Brilliant approach towards the pedestrianizing of the plaza, particularly the part south of North Avenue. Ideally we would want to flush out any traffic in the spaces between the green box and North Avenue after the reds on both Milwaukee and Damen in order to not trap them there when North Av. gets its green. Yes. Take parking off of arterials and extend metered parking up and down the side street feeders. Half a block should be enough. Create permit parking on the rest of the block as a bone for the complaining residents. Although there is likely already permit parking there. imho tough. It’s the city. Go back to the suburbs if you want freedom to congest. Parking in a TOD area is a privilege that needs to be paid for if not eliminated totally. The problem is the el stop. Get rid of it! Ok just joking. But two platform level or at least high enough for most truck traffic sidewalks along either side of Damen all the way across North Avenue with stairs down to the sidewalks all along the way would go a long way towards meeting pedestrian needs to and from the el. Then all the buildings along the second story walk way could convert the adjoining space to commercial uses! With you 100% rduke. Bikes should have their percentage share of the road. If parking has to go to make room, it has to go.